This comprehensive new book contains clear and engaging coverage of all key areas of the Australian Consumer Law (ACL), including misleading or deceptive conduct, unconscionable conduct, unfair contract terms, consumer guarantees, manufacturers' liability and specific unfair practices. 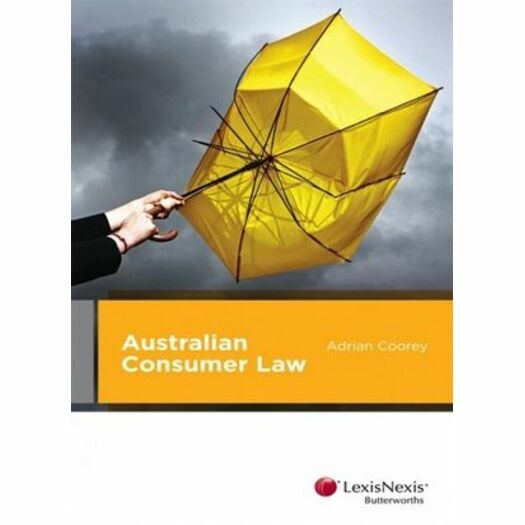 Australian Consumer Law includes four chapters offering detailed analysis of misleading or deceptive conduct and specific false or misleading representations, covering the general principles and misleading conduct both in advertising and other areas of law. It examines and compares the advantages and disadvantages of actions brought under s 18 of the ACL with other options for redress. It contains an in-depth examination of the ACL remedies and enforcement powers of the Australian Competition and Consumer Commission (ACCC) including damages, pecuniary penalties, injunctions, declarations and disqualification orders. includes case summaries, theory and problem questions and and further reading. The writing style is clear and succinct and the discussion includes a wide range of examples and analogies to explain complex areas of law. The depth and practical application of the text makes it ideal for undergraduate and postgraduate students of Australian consumer law or the more specific subject of misleading or deceptive conduct. It is also a valuable resource for researchers and lawyers practising in this area. Adrian Coorey has over 10 years' experience as a lawyer in consumer law and teaching related subjects in this area. For further details about his legal experience and academic qualifications, please see his author profile on LexisNexis website at Lexis Nexis Author Profiles, Adrian Coorey.